Two days of cooking demonstrations and tastings culminated in master classes with Chefs Gennaro Esposito of Torre del Saraceno in Vico Equense and Pino Cuttaia of La Madia in Licata, Sicily. Ossobuco in Gremolata alla Milanese is the featured recipe of this year's International Day of Italian Cuisines sponsored by Itchefs. Around the world on January 17, the feast day of Sant'Antonio Abate, Italian chefs will be featuring this iconic dish in celebration of authentic Italian cuisine. As part of the celebration, 2 days of classes and demonstrations were held at New York's International Culinary Center culminating in master classes with two of Italy's top chefs, Gennaro Esposito of Torre del Saraceno in Vico Equense and Pino Licata of La Madia in Licata, Sicily. substitutes a slow cooked onion puree for sauteed onion. What is more, the chef adds a little grated Grana Padano to the risotto, not to give it a cheesey taste which would interfere with the flavor of the fish, but to add more body. The chef dusted his serving plates with the zest of the unique Amalfi Coast lemons and a pinch of peperoncino before plating the risotto. Hot smoked bluefish and a ruffle of dried seaweed garnished the dish. It was unlike any risotto I have ever tried, and it was very good. For his second recipe Chef Gennaro made his personal interpretation of a classic fish soup. He pressed the juices from an assortment of cooked fish and vegetables and to this he added several different shapes of dried pasta, beginning with orecchiete, the thickest and ending with spaghetti. After adding each handful of pasta, the soup was stirred vigorously for several minutes. When the pasta was tender, the chef added some pieces of fish and seafood including seppia, shrimp and sea bream. The resulting soup was thick and creamy with plenty of texture from the seafood and pasta. Once again, it was a completely unique and personal dish. 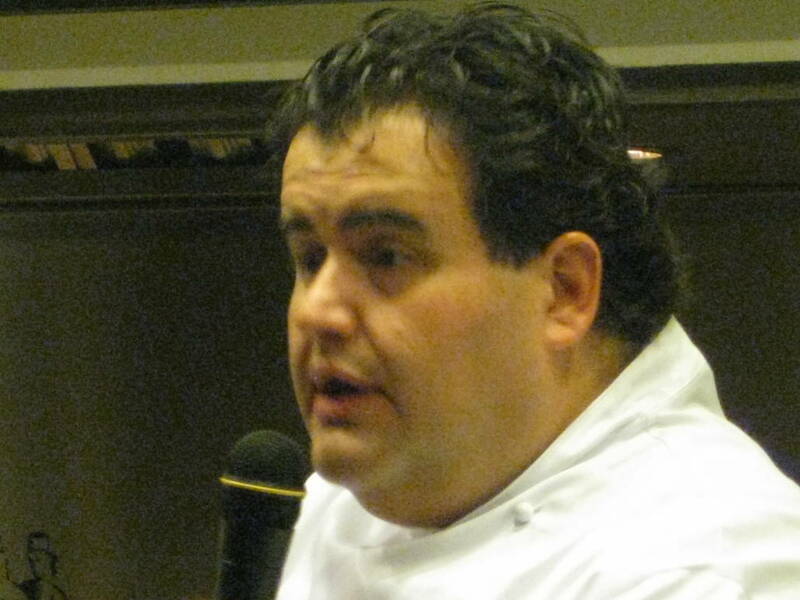 Chef Pino Cuttaia has been called one of Italy's best chefs and his restaurant named the best in Sicily. He, too, firmly believes in using the best local ingredients and uses his memory of traditional dishes to recreate them in novel ways. The first dish he presented was a cannolo or tube made by frying thin slices of eggplant until crisp and stuffing it with a ricotta and eggplant filling. He placed the tube inside of a long and skinny "perlina" eggplant, a variety native to his region, rolled the whole thing in cooked capelli d'angelo pasta and baked it until golden. If it sounds complicated and intricate, it was, but it was also very delicious, crunchy outside and creamy within. 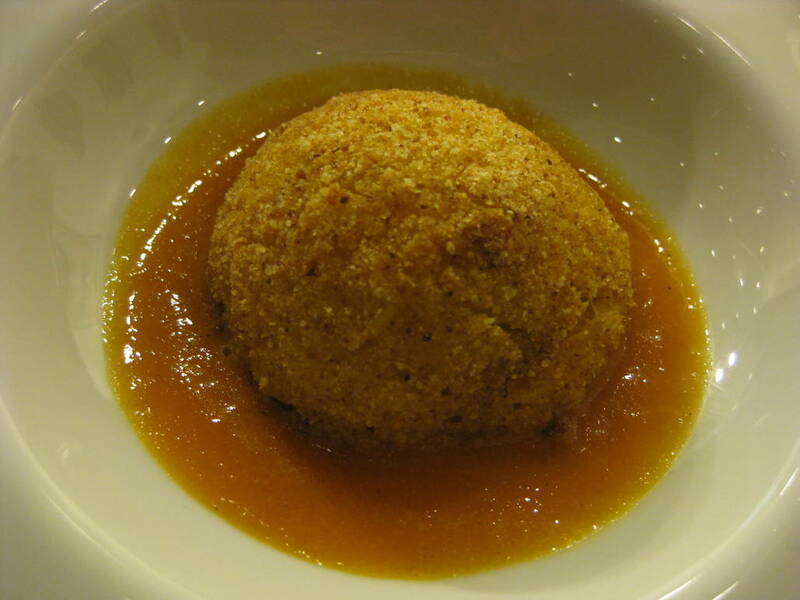 His next dish was based on the classic Sicilian arancini, or rice balls, but instead of a meat or cheese filling, Chef Pino fills half spheres of rice with a a ragu of sardines, wild fennel, currants and pine nuts, the traditional condiment for pasta con le sarde and serves them in a pool of fresh tomato sauce. His final recipe was the Cannolo Cornucopia pictured at the top, an interpretation of the classic Sicilian cannolo dessert. The fried pastry shell was thin and crunchy while the velvetty filling tasted of very fresh ricotta. Marmalade made from Sicilian oranges accompanied the dessert. 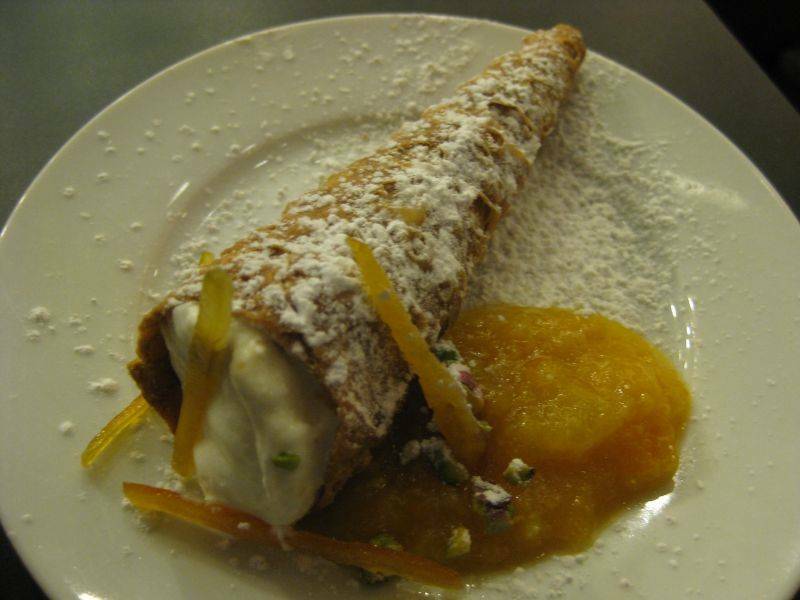 Chef Pino told us that the cannolo reflected the various cultures who had ventured into Sicily over the centuries.